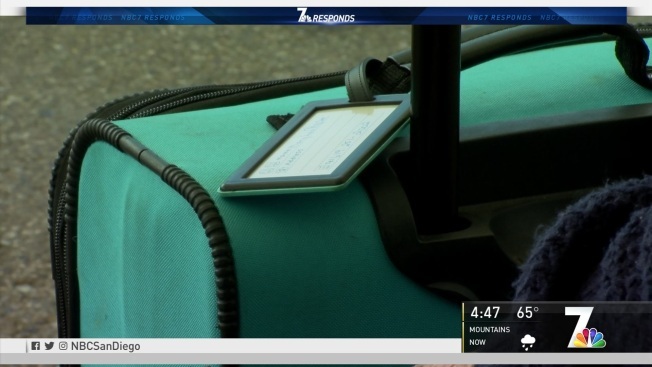 NBC 7 Responds offers some advice on what to do if your bags don't make the flight. Winter is over and more and more Americans will head to the airport for spring and summer travel. Last year 813.8 million people passed through airport security, according to TSA data obtained by NBC 7 Responds. And with those 813.8 million people came hundreds of millions more suitcases and baggage. And, it’s inevitable that some of those bags will get lost along the way. “It was a horrible experience,” said Sean Kelly when remembering the time the airlines lost his bags while on a recent work trip. Kelly is not the only one. With the travel season fast approaching, NBC 7 Responds is here to give a few tips on what you should do if you arrive at your destination but your bags don’t. First and foremost, go directly to the airline you flew on. “The second you realize that your bag is not there you should go to the airline desk right away,” said Doug Shupe, a spokesperson for the American Auto Association (AAA) of Southern California. If the airline is able to track down your bag’s location then ask for them to pay for toiletries or clothing to get you through until your bag arrives. If the airline tells you they will reimburse you then be sure to keep your receipts. In the unfortunate event that your bag is gone for good, then remember to ask for the deadline in filing a claim. Airlines are capable of reimbursing you up to $3,500 for lost items. But in order to get the proper amount you should remember to keep a log of the items you had inside and their value. Considering the number of luggage that goes through the airports every day the chances are small that your bags will get lost, but it’s always best to be prepared just in case you’re one of the unlucky ones.